The benefits go beyond skin deep. From swimsuits to playsuits, summer dressing is colourful and fun, but for many of us, it usually means trying boring detox diets and numerous body lotions to look our best. If you’re tired of the old routine, dry body brushing may be just the right answer. You’ll find the very affordable and simple skincare routine has amazing benefits for your skin. Your largest organ is a complex system made up of nerves, glands and cell layers, and when you keep it healthy, it’s one of the body’s most important organs when it comes to daily detoxification. It also acts as a buffer that helps protect your body from extreme temperatures and chemicals, amongst other crucial roles. As well as contributing to keeping you healthy, daily brush strokes leave your skin looking fresh and luminous and feeling soft and supple. Dry body brushing even boosts wellbeing because of the feel-good factor. The lymphatic system is in charge of flushing out cellular waste. Bacteria, toxins and waste from blood filter through the lymph nodes, where these substances are destroyed. When the lymphatic system is compromised, waste and toxins can build up and the blockage can lead to inflammation and disease. Dry body brushing is a strong detoxification tool as it can really stimulate the lymphatic system, helping to move the lymph along, which in return assists our own bodies to release toxins at a quicker rate. This strengthens our immune systems and lessens our susceptibility to illness. The older we get, the harder it becomes for our skin to shed layers of dead skin cells. Thankfully, dry body brushing does a great job at removing dead dry skin cells. As well as helping making skin smoother, exfoliation clears clogged pores and allows skin to breathe. Plus, regularly exfoliating this way prepares your skin to absorb the ingredients from body creams and serums much more efficiently. It’s a wonderful way for people with sensitive skin, who suffer when using body scrubs, to exfoliate. By dry body brushing your skin, you can amp up that circulation. A healthy blood flow instantly quickens the transportation of oxygen and nutrients to the cells and tissue, which helps increase collagen for a smooth appearance and sinuous feel. By delivering much-needed oxygen to cells, cellulite, varicose veins and skin discolouration can be prevented too. As dry body brushing encourages important blood flow, it has a plumping effect on the skin, which can really aid in diminishing the appearance of cellulite. While cellulite, an accumulation of toxicities in your body’s fat cells, won’t completely disappear, brushing can help to contribute to the even distribution of fat deposits under the skin and soften the hard fat deposits there. 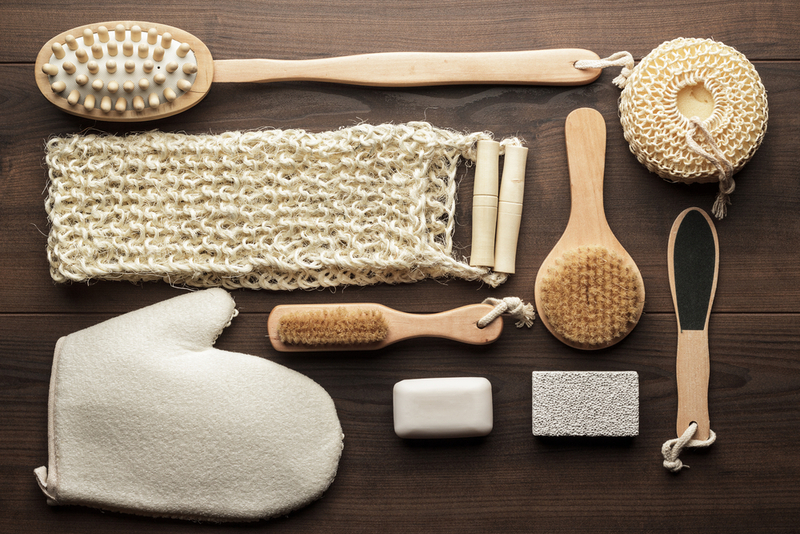 By regularly dry brushing skin, your limbs are bound to look firmer and feel smoother. The act of dry body brushing can easily be compared to a light body massage. It has been described as meditative as it can calm the mind, especially if you find a quiet spot. By setting time aside for the ritual, you can focus solely on yourself, plus the repetitive process can be very soothing. Dry body brushing can also ease muscle tension. While it can be extremely relaxing, dry body brushing can be energising all at the same time. It’s best done in the morning as it really intensifies energy levels, helping pave the way for a productive day. As outlined before, blood flow and circulation is stimulated by the brushing action, and as well as lending the skin a welcome boost, it invigorates the body and mind. Dry body brushing can even aid in supporting your digestion and kidney function. A lot of naturopathic doctors use dry brushing to help people deal with bloating because massaging the lymph nodes helps the body get rid of excess water and toxins. 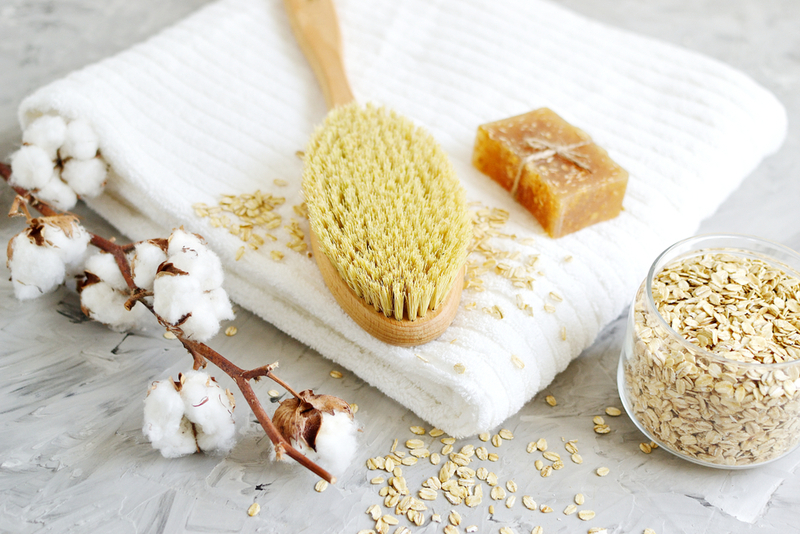 Whether you wax or shave, a dry skin brushing session is incredible at keeping irritating ingrown hairs under control. If you are having laser hair removal sessions, you will also find brushing will loosen the hairs that have been removed from the root, making them less prickly and resulting in fewer shadows.